Headache home remedies - what you can do now to relieve your headache! Want the BEST headache home remedies? Everyone has their own headache home remedies - but which ones really work? We've collected some of the best remedies to help you deal with the headache that you have right now. We've narrowed down these headache home remedies to the ones that are intended to bring relief right away. If you're looking for longer term treatments for headache and migraine, check out some of the other articles on this site. Also, our focus in this article is not on medications, foods and supplements, though one or two may be mentioned. One more disclaimer: If you're having a headache worse than any headache you've had before, or if your symptoms have changed, see a doctor right away. It could be very dangerous to wait! Aromatherapy isn't mentioned first because it's the best, but because you can use it with so many other therapies. First, make sure you're using a pure essential oil (a lot of what is called aromatherapy is actually aromachology. Learn the difference!) Look for scents that are well known as headache killers - peppermint, sandalwood (my favourite), lavender, and eucalyptus. Try using these scents (or mixtures) in a diffuser - let the scent diffuse for 15 minutes at a time. Certain oils can be used on the temples to relax the muscles and calm the headache. 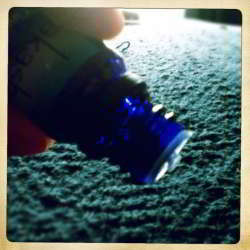 This study of essential oils for headache suggested that peppermint and eucalyptus oils were excellent. Use one of the above essential oils an drub it into your temples (note: some essential oils can burn - do your research first!). Foot massage: You'd be amazed at what a foot massage can do to instantly lessen head pain. Though I'd think twice before spending my money on reflexology, a simple massage with your thumbs or a simple foot massager like this can make a surprisingly big difference in your day. Head massage: For some types of headaches, this type of massage can relax the muscles and release the pain. Try doing your own massage with your finger tips. Or, have a friend or masseuse help you. 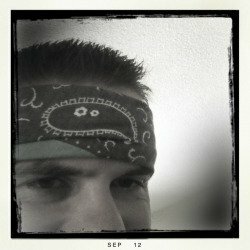 Headband: Believe it or not, wrapping a towel or bandana tightly around your head is a time-honoured treatment for migraine (Mexico even has a national hero who used it!). You can use dry material, or soak it first, applying a few drops of essential oil if you've found one you like. 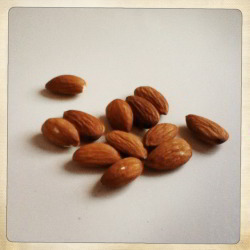 Eat 12 almonds: The best are raw almonds - watch out for the flavoured roasted kinds, which may contain MSG! Eating a few almonds can regulate your blood sugar and even kill the pain - almonds are known as a natural pain killer! A few people with migraine find almonds to be a trigger - but if that's not the case with you this could be one of the best headache home remedies, especially early in an attack. Spoonful of honey: Again, a trick to get some sugar in your blood. The Definitive Guide to Headaches recommends one spoonful, waiting half an hour, then taking another with 3 glasses of water if the headache is still there. Water: Speaking of water, getting dehydrated is a common trigger when it comes to headaches. Drink a large glass of water, then start sipping on another. Ginger: Ginger, ginger tea or candied ginger is not only a headache remedy, it can also fight nausea that comes with many migraine attacks. Many headache home remedies include ginger in various forms. Caffeine: Caffeine can both cause and kill a headache. Some people find that a can of Coke or cup of strong coffee will kill their headache. But beware - try caffeine too often and you may make the problem worse! If the headaches keep coming back, see a doctor. A compress is usually some kind of soft material held against the skin for a period of time. For example, a hot towel can be a compress. But actually, a compress can be hot or cold or wet or dry. Now that you know some of the secrets of aromatherapy, you can use what you know to make your own compress. Compresses are fantastic, inexpensive and easy headache home remedies, and you can customize them to be exactly the way you want them. For example, soak a towel in hot water with a few drops of your favourite essential oils. Besides what we've talked about above, other common herbs for compresses include: chamomile, rosemary, parsley, ginger, and marjoram. You can use hot water and a towel, or chill the towel in the fridge. You could also apply an ice pack to the compress. 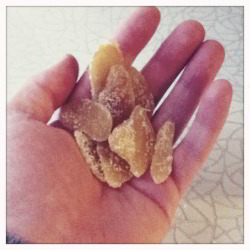 Try a ginger compress: Cut and peel one ginger root and boil in 3 cups of water, until the water becomes cloudy. Soak a washcloth in the mixture, and apply to your neck or forehead. Vinegar compress: Soak a towel or wash clothe with vinegar. Chill in the fridge, then apply to the forehead. Of course we've already talked about warm and cool compresses. Ice packs, hot water bottles, compresses, and so on, are very common and helpful headache home remedies. If you've tried cold, try heat. Or vice versa. Some people find that alternating cold and heat helps. Try a warm pack on your abdomen, or even on your feet, for headache pain. There are other ways to warm or cool one part of your body, including a foot bath or even putting your hands in warm/hot water. Breathing exercises are very useful and easy headache home remedies. Sit upright in a comfortable chair. Take slow, deep breaths, counting to 5 as you inhale, then again as you exhale. Also, try breathing more deeply - from the abdomen, breath in as much air as you can, then exhale all the way. WebMD has more tips for breathing exercises here. It may surprise you, but using "distraction" as a headache treatment is a well studied remedy. For example, a study published in Current Biology pointed out that there are biological changes that actually take place in your body when you're distracted from the pain. Read more in Distraction: It's not all in your head! Now, try doing something that distracts you. Listen to music, or an interesting podcast, or read a book. Go for a walk, talk to a friend. Whatever you're able to do that distracts you from the pain. Neck exercises are well known as headache remedies, especially if you have neck pain as well. Simple, slow stretching movement with the neck can go a long way. Don't overdo it! Keeping your head straight, try slowly turning your head all the way to the right, wait 10 seconds, then to the left. Repeat. Then try moving downward, hold, then look up, holding again. Read a few more tips in Exercises to Stretch the Neck. Visit the Migraine Association of Ireland for even more headache home remedies. Hopefully that will get you started - but there's lots more! Head back to the home page to check out many other resources to help you fight headache pain. References: Aromatherapy for Dummies by Kathi Keville; Definitive Guide to Headaches by Dr. Robert Milne, Blake More and Burton Golberg; The Migraine Brain: Your Breakthrough Guide to Fewer Headaches, Better Health by Dr. Carolyn Bernstein and Elain McArdle; and many more. The articles on Relieve-Migraine-Headache.com are ©2003-2018. and to point you to further sources of information. and should never replace a visit to your doctor.